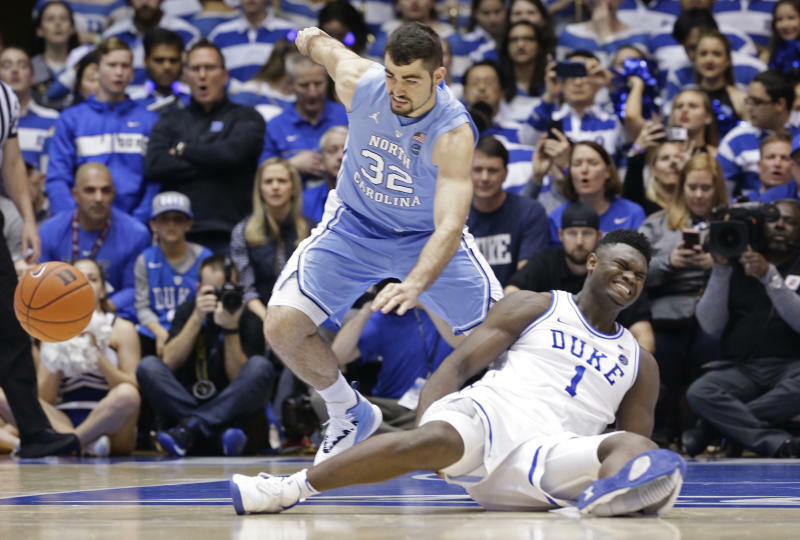 DURHAM, N.C. (AP) -- Duke might have to figure out what the Zion Show will look like without its namesake. All because of a freak injury to arguably the most exciting player in college basketball in the opening minute of the sport's fiercest rivalry, one that helped turn a widely anticipated matchup — in front of yet another crowd of celebrities, this one including Spike Lee and former President Barack Obama — into a blowout. As his Nike shoe blew out, Williamson sprained his right knee on the first possession of what became top-ranked Duke's 88-72 loss to No. 8 North Carolina on Wednesday night. In the aftermath of that loss, coach Mike Krzyzewski wasn't ready to look ahead. He was still trying to process just how quickly everything deflated after the injury. "I'd rather not talk about what we're going to do," Krzyzewski said. "I'd rather talk about what just happened. Because we're going to figure out what we're going to do. So I don't have that answer." Krzyzewski says Williamson's knee is stable and the sprain is mild, but doesn't know how much time his star freshman will miss. He doesn't have much time to find a replacement for the Atlantic Coast Conference's second-leading scorer and its most dynamic playmaker. The Blue Devils (23-3, 11-2) play Saturday night at Syracuse — which already knows how to beat a Duke team after it loses a key freshman to injury. The Orange beat No. 1 Duke last month in overtime after point guard Tre Jones injured a shoulder. Williamson averages 22.4 points, but his impact goes well beyond scoring. He also grabs 9.2 rebounds and has blocked nearly two shots per game. In his absence, North Carolina simply dominated the paint, outscoring the Blue Devils 62-28 there while also building a 46-41 rebounding advantage. The Tar Heels shot 51 percent — 57 percent in the second half — despite 2-for-20 shooting from 3-point range. RJ Barrett matched a season best with 33 points, and teammate Cameron Reddish had a season-high 27 — but the rest of the team combined for just 12 points. "I hope he's going to be OK," Barrett said of Williamson. "We don't really know where things are right now." Apparently, neither does Williamson. And now, a month after the freshman star swatted away questions about the prudence of risking injury by playing — Hall of Famer Scottie Pippen had suggested he'd be better off shutting it down for the year — that debate is sure to be reignited. Utah Jazz guard Donovan Mitchell, who played in college at Louisville, said on Twitter that "something has to change" in the wake of the injury. "Again let's remember all the money that went into this game.... and these players get none of it.... and now Zion gets hurt," he tweeted. Williamson grabbed his right knee in pain after slipping awkwardly and falling when his left shoe fell apart as he planted hard while dribbling near the free throw line. The blue rubber sole ripped loose from the white shoe from the heel to the toes along the outside edge, with Williamson's foot coming all the way through the large gap. He walked off with a slight limp, but under his own power, before heading to the locker room with no shoes on his feet. Nike said in a statement that it was "concerned" and wished Williamson a speedy recovery. It said it was "working to identify the issue." Obama — who watched the game from a baseline seat near the Duke bench — said on Twitter that Williamson "seems like an outstanding young man as well as an outstanding basketball player. Wishing him a speedy recovery." So are the Blue Devils.